This component uses the LinkedIn API to retrieve data and load it into a table. This stages the data, so the table is reloaded each time. You may then use transformations to enrich and manage the data in permanent tables. 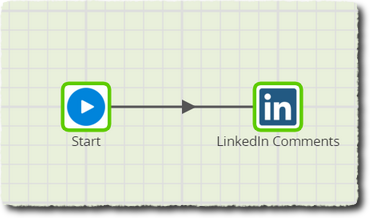 The component offers both a Basic and Advanced mode (see below) for generating the LinkedIn API query. Note that although this is exposed in an SQL-like language, the exact semantics can be surprising - for example filtering on a column can return more data than not filtering on it, an impossible scenario with regular SQL. 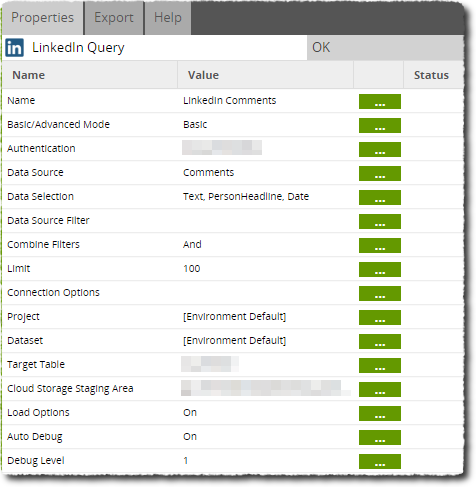 Basic/Advanced Mode Choice Basic - This mode will build a LinkedIn Query for you using settings from Data Source, Data Selection and Data Source Filter parameters. In most cases, this will be sufficient. 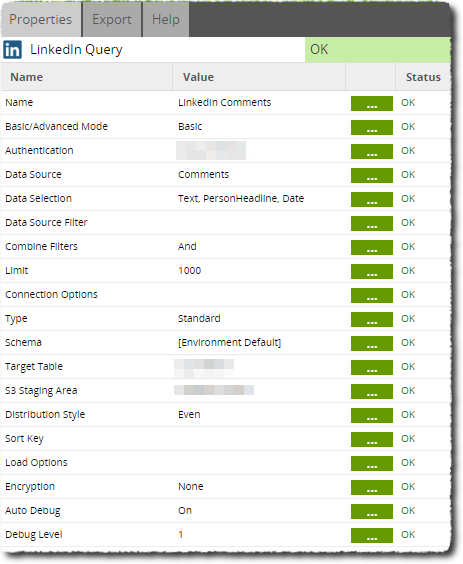 Advanced - This mode will require you to write an SQL-like query which is translated into one or more LinkedIn API calls. The available fields and their descriptions are documented in the data model. Authentication Choice Select an authentication method, which must be setup in advance. LinkedIn uses the OAuth standard for authenticating 3rd party applications. More help is provided in the OAuth setup documentation. Data Source Choice Select a data source, for example Comments. SQL Query Text This is an SQL-like query, written according to the LinkedIn data model. Limit Number Fetching a large number of results from LinkedIn will use multiple API calls. These calls are rate-limited by the provider, so fetching a very large number may result in errors. Value A value for the given Parameter. The parameters and allowed values for the LinkedIn provider are explained here. Snowflake Managed: Allow Matillion ETL to create and use a temporary internal stage on Snowflake for staging the data. This stage, along with the staged data, will cease to exist after loading is complete. 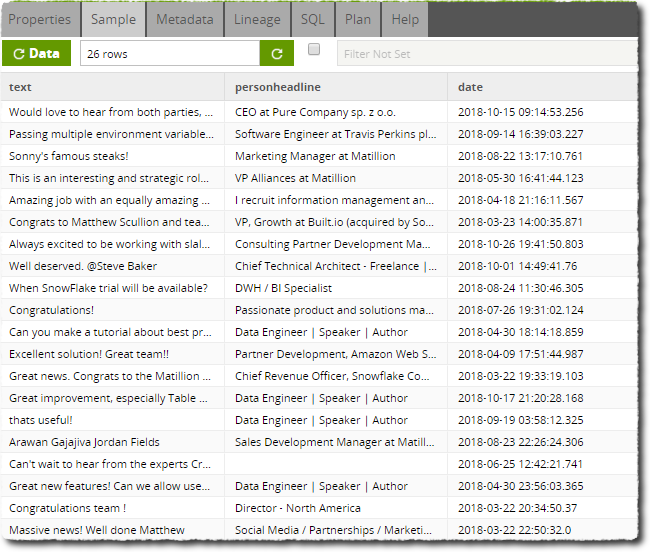 In this example, we used the LinkedIn Query component to gather data on comments made in response to Matillion's LinkedIn status updates. 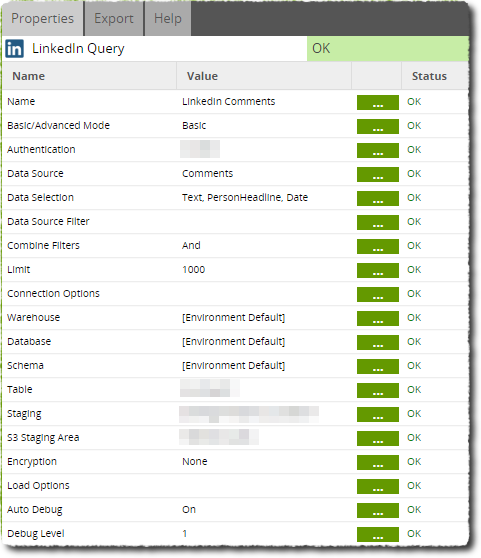 By using the LinkedIn Query component in this way, we can ensure that we're not missing any comments on our updates, and we can analyse comments in bulk. Further to this, we can see an overview of the professions occupied by the LinkedIn users who are engaging with our status updates. By analysing our LinkedIn status update comment data in this way, we can make decisions regarding how we approach our audience going forward with future posts, news, and content. So, to load our data, we run the LinkedIn Query component. This job is shown below. The LinkedIn Query component Properties are set up as shown in the next image. We've configured our Authentication using LinkedIn's developer site (in conjunction with our Manage OAuth feature). Our validated authentication enables us to choose Comments as our Data Source. For the Data Selection parameter, we chose the Items of data with which we want to populate our table's columns. Namely the comment Text, the PersonHeadline (this is a LinkedIn user's bio headline), and the Date of the comments. Please read through our LinkedIn OAuth documentation if you need assistance setting up OAuth authentication before you use the LinkedIn Query component.